And everything else at My Favourite Magazines. For the next couple of days, you can get 20 percent off absolutely everything at My Favourite Magazines, including the extremely glossy and informative PC Gamer magazine. It's filled with excellent words and articles that you won't find here on the website. It's a perfect time to grab a subscription. Grab what you want and use the code MARCH20 to shave off 20 percent. You can get digital and physical subscriptions and back issues across the store, covering all your game and hardware needs. 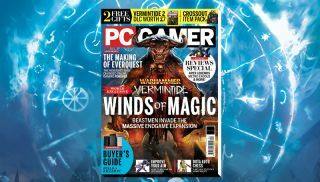 Every month the PC Gamer magazine is chock-full of reviews, previews, in-depth features and an unhealthy amount of puns. The sale has already started and will run until 12:00 BST 31st March 2019.